The border of the design has a very arabesque element with jewel tones and peaked domes that reminded me of the magnificent Ottoman art and architecture I had seen on a trip to Turkey. Strangely, this was in no way the inspiration for the design but I think it adds a touch of Oriental opulence! 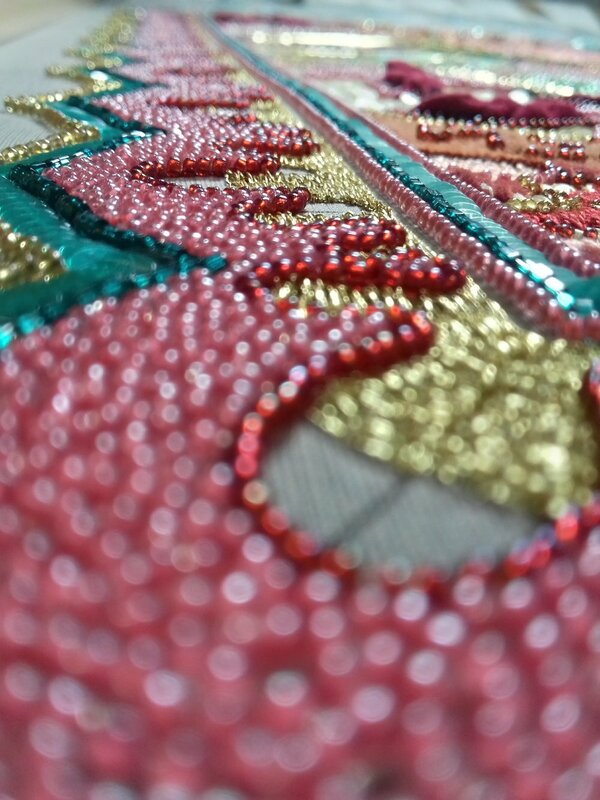 The pink lines indicate rows of tiny pink seed beads, the blue lines are rows of matt and gloss sequins applied in a river with the direction indicated by tiny arrows, the turquoise line is turquoise tube beads, the grey area is a filling chain stitch in gold metallic thread, the red line is a row of red seed beads, the pink area is vermicelli beads and the blue drop shapes are chenille satin stitch accented by large blue jewels in the four corners, the grey line a final outline of gold beads. Truthfully, it was a real test of stamina to complete the border as it measures 140cms and the sheer volume of work was intimidating. While there was not a lot of techniques, the size of the area meant that it was time-consuming. I would estimate that in total I spent at least 250 hours working on it! It was a case of practice, practice, practice and in repeating the gestures I hoped that I would master the techniques. I tried to take a gradual approach and do it bit by bit, starting with the rows of beads. Next I tackled the rows of sequins and the minuscule matt turquoise ones were impossible, the sequins would stick together and it took ages to stop, separate them and then continue on. The gold filling chain stitch was relatively simply and easy, and once it was completed it had a lot of impact so it cheered me on. This was outlined with a curving contour of red seed beads. I left the pink vermicelli beads for last, avoiding what I knew would be a mammoth task. Each morning I would overestimate my progress and each evening I would wonder where the time had gone and if I would ever complete it. I was determined though, I had seen several students finish the Professional Training without completing their piece and I knew I would be really disappointed if that happened. So I toiled away at the pink vermicelli bead section, progressing by inches each day and then beginning the laborious task of filling in the gaps I had left. At last the moment came when I applied the final bead and tied the final knot. Next, blue chenille thread was added in satin stitch between the gold metallic thread and the pink vermicelli beads, creating a lovely contrast in textures. And the finishing touch was large blue swarovski jewels in each corner.